We evolved to run. To move over our earth quickly, for long distances, in order to hunt, to eat and communicate. It’s good for our bodies and good for our heads; historically and physiologically, it’s part of what we are. But there’s a gap at the heart of our experience as runners, between our feet and the earth. Running shouldn’t just be an alternative to lifting weights and or avoiding cream cakes. It shouldn’t be about winning or beating a time in a herded mass through a metropolis. Don’t we want our running to reclaim a connection with the earth beneath our trainers? To know the land, the birds, cloud formations, the history of a place, its geography and geology? Boff Whalley heads towards the mud, rock, and tree tangle of surprise and unpredictability to experience something utterly memorable and notoriously wild. Be alone on a hilltop, beside a river, in the dense heart of the forest. Stop and listen. Rediscover the freedom of following your nose. Find space to think, time to breathe. And most importantly, enjoy yourself. Looking for a real world of discovery and adventure? This book will take you there. There are times when I’ve scurried across grassy hillsides like a crab, and times when I’ve bounced down scree-slopes like a chucked apple, but I get the point. Running, especially the kind of running I champion, is about mud and trail, rain and hail. About being outside, getting physical with whatever Nature throws at you. And writing is about … well, it’s about cups of tea, a laptop screen, some scruffy notes and a deadline. But there is, for me, a connection between the two, and I’d describe it ham-fistedly as the pursuit of meaning. When I’m off up Otley Chevin in the middle of a summer cloudburst, thunder rumbling somewhere over Skipton and lightning cracking somewhere a lot nearer, I get a feeling for my place in the world. The world under my feet, what we politically call ‘the environment’ but which to runners is mud, glorious mud. The squelchy brown stuff that sustains everything. And writing is, at its best, a similar attempt to capture a bit of sense, explain things, understand stuff. What’s Shakespeare’s drama if not a way of talking about the world, about love and fear and power? To stretch the comparison, I’d say that the average corporate-sponsored urban fun run roughly equates to an article in Hello! Magazine: instant gratification with little long-lasting effect. And that a day out running on the hills of the English Lake District compares broadly to something by (for instance) Jay Griffiths, currently my favourite writer: a senses-filling journey that takes you up, down and around a jumble of words and ideas: often difficult, but always worth it. You know the feeling you get when you put a finished book down, a book that’s completely captivated you? I reckon that’s pretty close to the feeling you get sitting on the grass at the foot of that last lung-bursting descent of Sca Fell, when you can look back and acknowledge that you loved every minute of it. So anyway, to get to the point. I wrote a book about off-road running called ‘Run Wild’ – running on trails, fells, forests and mountains (oh, and canal banks and parkland; I’ve lived in Leeds for 30 years after all). Soon after it was published, various festivals (including Ilkley Literature Festival) asked me to come and talk about it. Presumably (I assumed) to audiences made up mostly of runners, all of us in a room somewhere dancing about architecture. But books about running aren’t the same as books about climbing the Matterhorn or trekking solo to the South Pole. Those are adventure books, books to read in front of a fire, books that make you feel glad you’re not the one who’s actually doing the trekking, frostbite eating away at your toes and fish for tea again. No, the point about writing about running, or indeed talking at festivals about writing about running (!) is that it’s all a clarion call, an encouragement to join in the fun. An invitation. Come on in, the water’s lovely! It’s like those pub conversations that runners have, egging each other on to enter such-and-such a race or accept this-or-that mad challenge, all hot air designed to get you out of the pub and into your running shoes. So yes, writing and running. Apples and crabs and the pursuit of meaning. But above all, and put as simply as possible, it’s just words that get you going. Words that accompany you out of the door and onto the canal bank, along the towpath to the woods, up through the old quarry, into the fields, back round the top of the valley, following the stream back down to the canal, and finally, home. Where, with a bit of luck, you can shower, put the kettle on and sit down with a good book. Inspirational...Boff's passion is for fells and forests, streams and screes and snowdrifts... He s the runner's Thoreau... A heartfelt celebration of the joy of sponsor-free, off-road running takes in some bracing detours to denounce corporate control over modern athletics. [Whalley] takes to the leafy trails, the rocky tracks that zigzag a mountain range and the well-worn byways created by centuries of footfall. Places of natural beauty that the eyes can feast upon...Run Wild is an uplifting tale of freedom and unadorned pleasure that is hugely readable. Run Wild is equal parts advocacy and eclecticism...I found the higgledy-piggledy nature of the book (his description, no mine) hard to get to grips with at first. Suddenly, though, it all fell in to place. This is just like running, I thought. The way your brain shifts around from place to place until you've found a rhythm and you find yourself following a completely unexpected train of thought. His book is a rallying cry to leave the pavements behind and head for the hills, to rediscover the childish joy and playfulness that comes from being outdoors, unrestrained by walls and traffic lights and architecture. To Boff Whalley, running isn t about pounding the pavements or a treadmill. It s the mud, spit and sweat of running in the wild, through forest, up and down scraggy hills, in sunshine, rain and snow... his 'tug you by the sleeve' style and thoughtful asides make for an engaging journey. This is not a how-to guide, but a call to legs: anyone can, and should, escape urban life and run, he writes. And it should be fun. This energising read will spark a desire to head for the hills. Trail running and anarchic punk pop seem odd bedfellows, but in the form of Boff Whalley, guitarist with Chumbawamba, they make perfect companions. 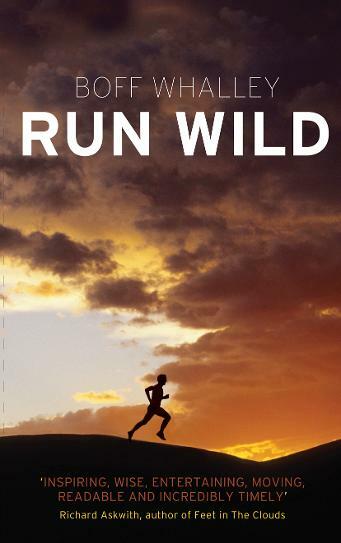 Run Wild is a lively, funny read that urges you to leave tarmac behind and discover the freedom of running through field and forest. It's an autobiography of discovering the delights and thrills of running wild. We defy you to read this and not want to lace up your trainers and run through your nearest green space. A paean to running away from the city and reconnecting with the earth.